Argentine tango singer Martín Alvarado has won a prestigious award last month in the United Kingdom. He was declared winner of the category “Concert by International Artist of the Year” in the Latin UK Awards for a performance in London last year. Alvarado was nominated for the awards – the only awards in the UK that recognise excellence in the Latin American entertainments world – by Latino Music UK, a London-based website which reviewed his concert at The Forge in Camden last March. Alvarado will collect the award at the Café de Paris (during his March UK tour - see here for details: www.worldmusic.co.uk/martin_alvarado_tango_uk_tour_march_2013) in the heart of London’s West End. Alvarado clinched the title after a 12-week internet ballot. The exact number of votes he amassed has yet to be confirmed by the organisers but it is believed he came close to the 9,000 mark and is believed to have achieved the highest number in the entire awards which had over 50 categories. Competing in the same category were the likes of Colombian rock star Juanes, salsa legend Oscar de Leon and Grammy-winning Spanish pop singer David Bisbal - and even Jennifer Lopez. Winning the award is a double success for Alvarado who also just signed a deal with a highly regarded UK-based world music record label World Music Network release his last album "Más Allá". 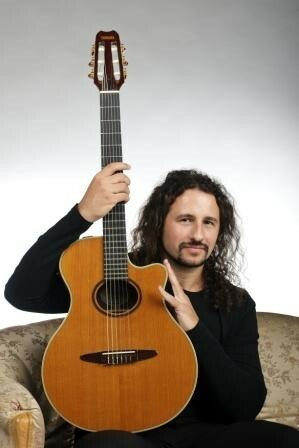 The deal, which will see the album released in the summer (2013), and distributed worldwide for the first time in both digital and physical format, makes him the only Argentinean artist to have an entire acoustic tango album released through this label, which has some of the biggest names in world music on its roster. Alvarado, who was born and raised in the Buenos Aires barrio of Flores, has won wide acclaim across the world for his “extraordinarily beautiful” tenor voice, and already, his acknowledged artistry is such that he is increasingly being recognised as a highly influential vocalist in the history of tango. In Russia last year, he was described as “a new Carlos Gardel” while in Argentina recently he was described as a modern “cantor nacional” – (national singer), the term used to describe artists, such as Gardel with the talent to sing in many different styles. As well as tango, Alvarado also sings milongas, valses, candombes, zambas, and has written over 70 pop and rock songs as well as Spanish versions of several well-known Finnish and Russian tangos. He has been touring almost continuously for the past ten years. During this time, his tours have been entirely self-funded without any artistic bursaries or grants and have seen him perform and headline at many major venues and festivals, often being the first Argentine artist to have ever performed at such venues. His current tour takes in Finland, Russia, Belgium and the UK. In Argentina, where his music has daily airplay on tango radio stations, Alvarado engenders much national pride for the way the way he has become something of a cultural ambassador for his country’s rich musical heritage. As well as being a naturally gifted vocalist, he is also renowned for his commanding and charismatic stage presence and his outstanding and carefully chosen repertoire from four albums, which features work by Argentina’s most celebrated poets and composers, including rare work by Astor Piazzolla, as well as some of his own, as yet unrecorded, compositions. He discovered his talent to sing at the age of 19, by chance, while studying guitar in Buenos Aires. A few years later he travelled to Spain where he was spotted singing in Barcelona and invited to perform in Finland, where tango is a hugely popular activity. News of his talent quickly spread and within two months of arriving there, he was performing with the Tampere Philharmonic Orchestra. Since then he has performed more than 400 times, often to sold-out audiences, had numerous TV performances in Finland, Russia, Slovenia and Argentina and collaborated and performed with some of the leading musicians in the genre. These include the highly revered bandoneon player, Leopoldo Federico, who was a guest performer on his second album, “Así es mi tango”, Horacio Avilano, a prominent guitarist in Argentina, who worked with him on his last album “Más Allá” and renowned Finnish tango nuevo quintet Otra Vez with whom he recorded his third album “Tango Norte Tango Sur”. In 2008, Alvarado starred in the cutting-edge "El concierto del Nuevo Tango” with internationally-renowned conductor and flautist Patrick Gallois, Otra Vez and symphony orchestras and, separately, with Finland’s celebrated UMO jazz orchestra. In 2009, he took part in Piazzolla’s operita “María de Buenos Aires” on its first Polish version and several times in Finland. He starred in it again in July last year (2012) after being invited to perform, for the second time, at the Kuhmo Chamber Music Festival, one of the most prestigious chamber music festivals in the world. He is currently working on three new albums, one with Horacio Avilano, one with highly acclaimed pianist Mikko Helenius, of Finland, and another with one the most avant garde tango pianists in the world today, Finland’s Matti Laukkanen. [Carlos Gardel is generally regarded as tango’s most famous and finest vocalist. He died in a plane crash at the height of his career in 1935].